On this page you will find a mixture of the magazine covers, featured articles, pictures, small-ruminant-publications sales reports and performance-test reports that our goats have appeared in. Many have nuggets of information about our goats and the farm and some interesting pictures. ​The information appearing in the above ad was current. After this, Copyright went on to have had 4 sons make the Maryland Test Final Selected Group. Bluejay went on to have his sons on test in 2015 be hugely successful with very high ADGs and all of his 4 sons tested that year ended up in the top ten ADG Kikos independently tested. The "AKGA Kiko Cornerstones and Breed Guidelines" were developed by the AKGA Performance Committee, of which PJ Murphy has been the Chair since its formation in 2012. They aim to offer new and established breeders some guidelines on expectations and goals for the Kiko Breed. The breed is a performance based breed - not a Show Breed - and as such is focused on measurements of actual field production and not solely on appearance. 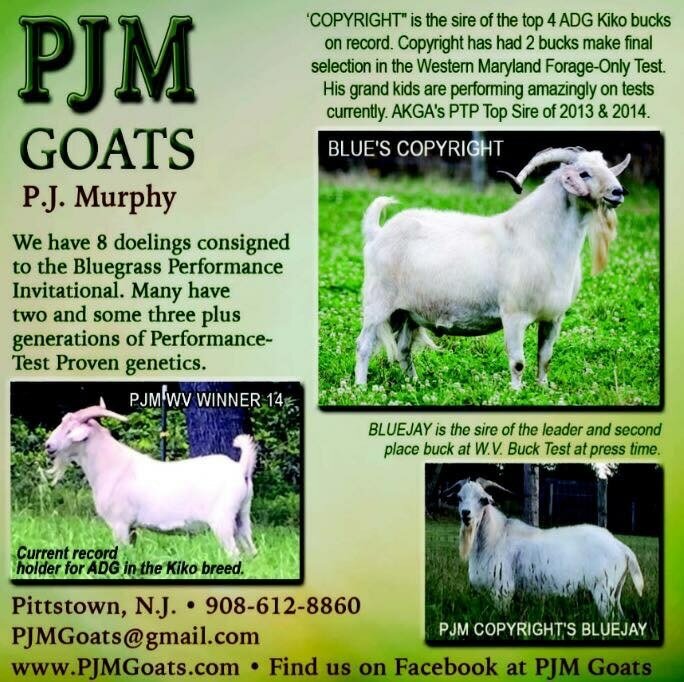 They are shared here as they are a good outline of the goals of my breeding program and are indicative of the focus of The American Kiko-Goat Breed Association - The AKGA. The AKGA “Kiko Cornerstones” and Breed Guidelines. The Kiko Goat has proved itself as the most useful meat goat breed overall in the North America. To help the breed maintain its focus on being a balanced performer capable of maternal production and terminal sire duties, the AKGA offers the following guidelines for Kiko Goats to offer guidance to its members in their Kiko Goat breeding operations. 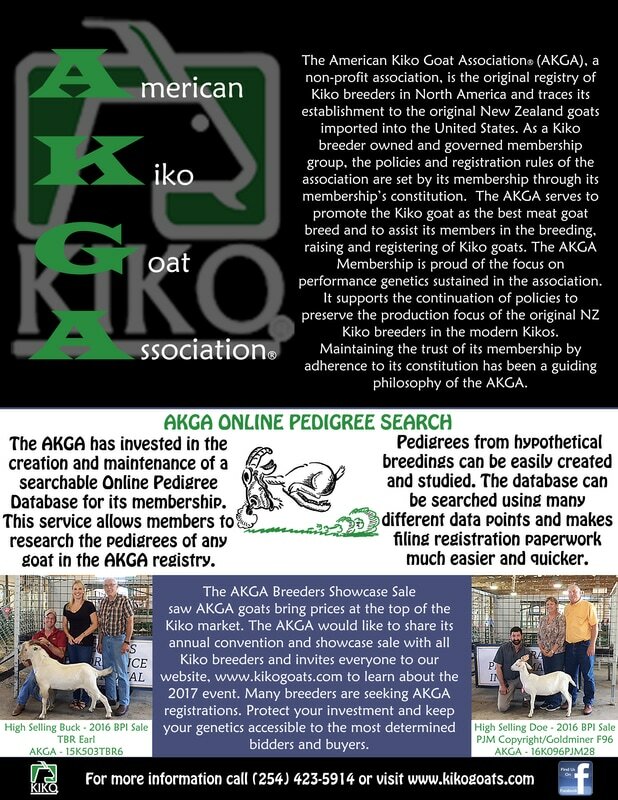 As the original Kiko Breed Association, the welfare and success of the breed is a long term concern of all AKGA members. To define “performance”, firstly we must define the ideals of “The Kiko Meat Goat”. Once we clearly identify the ideals of the breed, only then can we hold our goats up to those ideals to assess their performance. We can then define the breed using those ideals and that will allow us to compare our goats to the ideal “Performance”. To help new breeders quickly understand the expectations placed upon the breed and offer guidance to current breeders in their production goals, the AKGA Breed Guide Lines were developed. A review of expectations placed on livestock which perform under appropriately minimal inputs in common commercial production environments was conducted. During that review, several points arose. There was no need to “reinvent the wheel”. Other breeds from around the world offered insights for us to follow. Many performance dog breeds offer insights, including Livestock Guardian Breeds. There are hundreds of “Landrace” Livestock Breeds which are regionally adapted and useful to the farmers of their areas. Performance Horses of all sorts have been bred across the world. A review of other breeds and their expectations also made it clear that defining performance expectations will keep a breed focused on performance. It is clear that “Pretty is as pretty does” in performance focused breeds. To achieve a sustainable breed in the long term, a breed needs a clear outline of performance expectations. Those expectations will help the breed move forward and keep numbers and data in perspective. After the review, four main areas of focus were identified. These are called the “Kiko Cornerstones”. In outlining expectations under each “cornerstone”, a set of breed guidelines emerged. The points outlined after each “Cornerstone” are suggested goals for each breeder and the implementation of the culling necessary to achieve the goals are to be determined by each breeder in a manner in keeping with their own breeding practices. Good Body Condition Scores (3 plus on 1-5 scale) under appropriate minimal input conditions is expected. Good BCS is necessary for Fertility, Prolificacy and a high degree of muscling. An ideal udder should completely retract/shrink back to less than 4” long. Some minor allowance can be made for age. At a minimum, the does which produce the lowest 10% of kid Weaning Weights should be removed annually from the doe herd to encourage improvement in the herd. The animals which are balanced in the “Kiko Cornerstone” traits will be desired by all buyers and add value by making both males and female replacements desirable from the Kiko Breed. This is because the guidelines are developed by using the ideals of meat goat producers to define the breed. Using the “Kiko Cornerstones” of Hardiness, Weight, Conformation and Doe Productivity to define the breed gives the AKGA the following definition to offer to its members. ​In June of 2016, we were proud and elated to have an exceptional doeling from a test proven NZ family, top the AKGA Premier Sale. The doeling had a brother with excellent data produced from the 2015 WV Test. This individual had length, width and substance and the bidding for her was fast and furious. In the end, Kenneth Jesse got her and we are very happy she went to a good and caring owner with good intentions of breeding her to proven sires. ​Also pictured is Wes and Bev Pinneo along with Angie and Jim Loos who had the three Maiden Does selected by Dr Browning as the yearling does with most potential. I bought one of them - Produced by Wes Pinneo and she is a "Beauty". 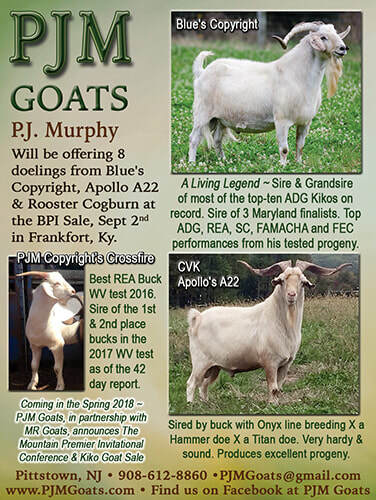 ​September 2nd and 3rd seen the third Blue Grass Performance Invitational Sale have a successful event in Frankfort, KY. At this sale we were again delighted that all our goats sold well with strong demand. Troy Lohman was our volume buyer and we thank him for his confidence in our program and the goats. Kenneth Jesse secured our top selling doeling. She was my favorite in the group. I must say, I did a poor job of presenting the doeling for the picture above. She really is an attractive doe and from one of my favorite and most productive NZ does who has lots of size and I have retained two of her half sisters. Good luck and thank you to Kenneth and Connie Jesse. 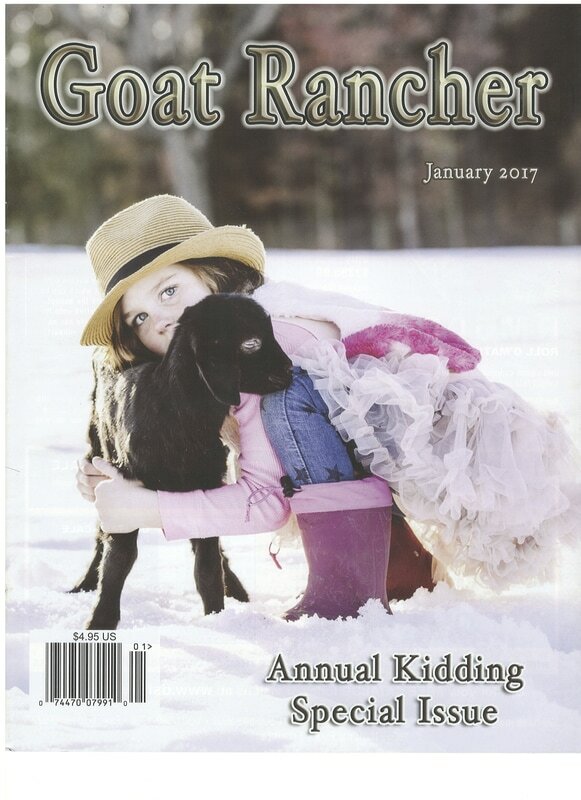 Pictured on the cover of The Goat Rancher of January of 2017 are two kids that I have produced. One is my own dear darling Anna Murphy. The baby goat was a "Copyright Harvest Starz" kid and out of a "Copyright" doe. Anna has always been beautiful and photogenic and she is pictured here by my wife Hilary. Hilary is a professional photographer and has been published several times nationally. Above: An article featuring our farm was published in the Meat Goat issue of "The Shepherd" Magazine in 2015. 2015 seen our consignment at the Maryland Test be the fast gaining and heaviest consignment at the extremely tough Maryland Forage-Based test. 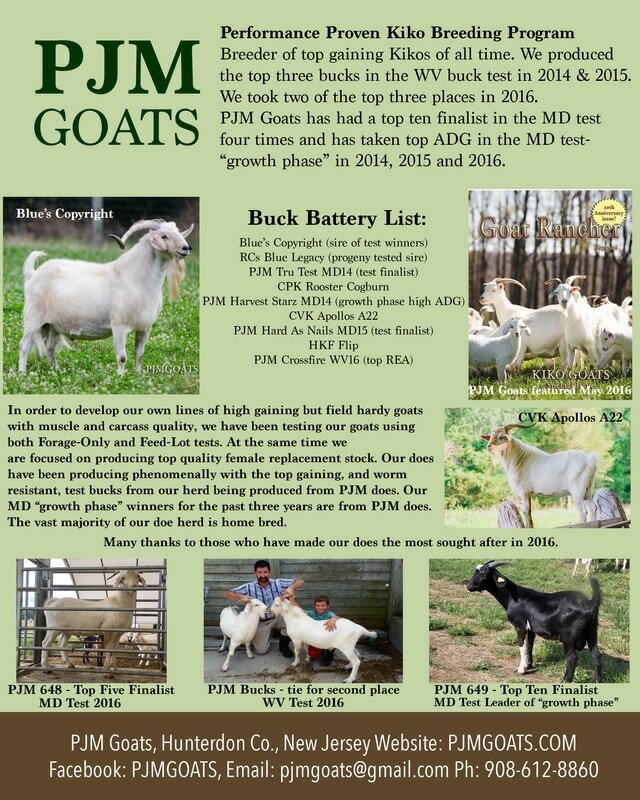 The same year seen PJM consignment be the highest ADG and REA goats at the WV Test, After setting all time records in WV in 2014 also. We were proud of the kids. 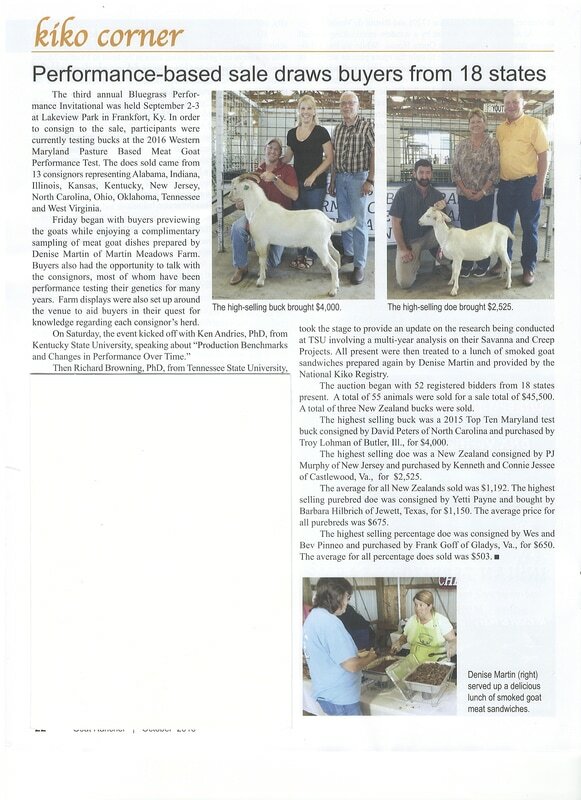 ​The January 2017 Farm Show Magazine featured the Kiko Goat breed and our operation as well as the AKGA - The American Kiko Goat Association. The first Kiko Goat Association and the owners of the original Kiko Goat registry in the United States. Those interested in breeding may be interested to know that the two most prominent bucks in the top picture are (Left) PJM Bluejays Twist and (Right) PJM Bluejays Cross Cut. Cross Cut had the best REA figures in the 2015 WV Test. The Caped kid pictured in the article was a son of Cross Cut - and was a line bred kid to RAK Austin's Boy. ​In 2016 I retained a 3/4 brother to Cross Cut as a prospective herd sire - I called him PJM Copyrights Crossfire. Above: Our "High Selling" doe at the 2016 AKGA Premier Sale was featured in the SEKGA Catalog in the AKGA full page ad. 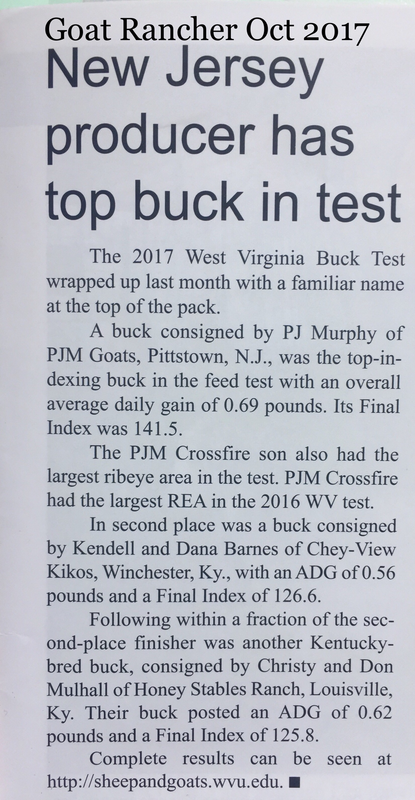 ​The WV Ram and Buck Test seen two of our bucks earn joint second Place at the test. The test was crowded and had about forty bucks competing to gain well. In addition to joint second ADGs, one of our consignment was the best Rib-Eye-Area buck also. That buck is retained and we have called him PJM Crossfire. I retained another buck from this test also and he is called PJM Doemaker. His dam has been very productive and is line bred to Sunboy Austin through GIN W07 aka "Kiwi King" and RAK Austin's Boy. 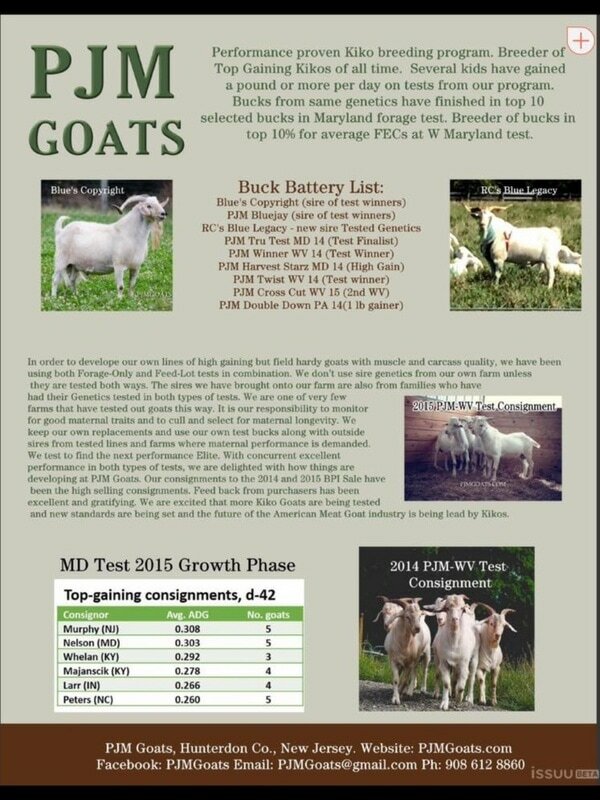 Our testing year in 2016 ended up with joint second place ADG bucks in WV Test but even more thrilling was to have two kids from our four kid consignment make the finl ten selection group in the 2016 Maryland Test. The test started with over 90 goats. About 20% of those goats did not even finish the test. Again, as in 2015, one of our kids took the darkest average FAMACHA with an average of 1 - the darkest possible through the entire test. One of the top ten finalists was also the highest ADG buck in the "Growth Phase" of the test. Both have been retained as prospective herd sires at this time. We have called the white buck - PJM "Top Five" and the black buck was called PJM "Steel Nail". We have had six finalist in the Maryland Forage-Based Test to 2016.